Camden has been Cooper University Health Care’s home for more than 131 years. We are proud to play an integral role in the city’s revitalization, making Camden a better, safer, and healthier place to live and work. Over the past five years, Camden has experienced an unprecedented renaissance in economic growth and vitality. Evidence of this resurgence can be seen in the public schools, in safer neighborhoods, and in a blossoming business environment. The city’s business community is rapidly expanding and thriving, with major corporations – including Holtec International, Subaru of America, and New Jersey American Water – relocating their U.S. headquarters to Camden. The education and medicine sectors (eds and meds) have also expanded, accounting for 40 percent of all jobs in Camden. Flagship educational institutes such as Rutgers University and Cooper Medical School of Rowan University are providing the platforms for the next generation of industry leaders. Anchor health care institutions such as Cooper are regional leaders in providing advanced health care services. New Helipad – Late last year we renovated the helipad that supports Cooper’s Trauma and Critical Care transport services. New safety enhancements help us better serve our patients needing these advanced life-saving services. new operating rooms at the hospital—bringing the number of ORs system-wide to 38. Emergency Room Addition – A 5,500 square-foot addition to the Cooper Emergency Department has reduced wait times and improved patients’ experience. New Outpatient Diagnostic Mammography Center – MD Anderson Cancer Center at Cooper opened a new outpatient diagnostic mammography center on our Camden campus. New Power Plant – A new power plant is under construction that will provide efficient power to all Cooper’s city facilities and ensure the hospital has power to operate during public power outages. employs more than 630 physicians and surgeons in more than 75 specialties. of cancer services in South Jersey, with approximately 100,000 patient visits each year. Cooper’s Early Intervention Program (EIP) – This vital program provides early diagnosis, compassionate medical care, and support services—regardless of ability to pay – to those affected by HIV in the region. Our Camden location has recently undergone substantial renovation and expansion. Specialized Health Care for the Military and First Responders – Cooper is committed to providing the highest quality of care for those who put their lives on the line for others. 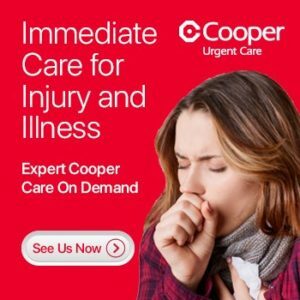 Cooper offers several programs dedicated to keeping members of the military, their families, veterans, as well as first responders healthy while providing timely appointments and access. Medical Assistant Training Program – This program was established by Cooper to fill the need for entry-level medical assistants in Camden. Upon completion of the program, trainees receive full-time employment at Cooper or at another health care system in Camden. Cooper Health Care Careers Initiative – A partnership with Camden County and HopeWorks provides free medical-coding training for Camden residents. Trainees who complete the program are offered medical coding jobs at Cooper. Promoting healthy lifestyles through Camden Health & Athletic Association (CHAA) youth sports programs. Coordinating the free, family-friendly, annual Summer in the City Music Festival concert series, now in its 8th year. Donating backpacks filled with school supplies ensuring that underserved youth have the tools for success. 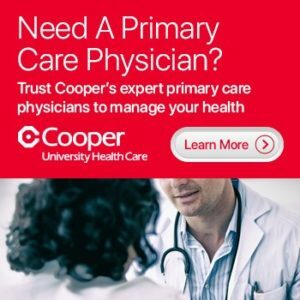 Cooper opened an innovative school based health clinic at the KIPP Cooper Norcross Academy to provide sick and well visits for students at KIPP, Wiggins School, and Center for Family Services Head Start students. serving more than 1,300 students K through 8th grades. Our neighborhoods are safer: the crime rate is at a 50-year low due to an aggressive community-policing program. High school graduation rates have increased 22 percent, along with greater interest in higher education. Camden’s poverty rate has dropped 25 percent, as more residents are getting back to work at jobs that didn’t exist in previous years. Camden’s employment rate has increased 24.7 percent from 2010 to 2014 – with 55.4 percent of jobs in the health-care and education sectors. As Camden continues on this positive trajectory, Cooper is committed to building on its legacy of serving the needs of the community – now and for years to come.